This unique video shows a full launch of the Soyuz MS-09: from liftoff to orbit. Watch the launch from inside the crew capsule with first-ever shots from outside the spacecraft recorded by cameras fixed to the exterior of the Soyuz. 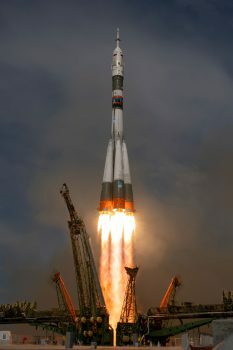 The intense launch lasts less than ten minutes whereby the Soyuz spacecraft is propelled 1640 km and gains 210 km altitude. Every second for nine minutes, the spacecraft accelerates 50 km/h on average as the rocket’s boosters burn their fuel and are discarded. See the astronaut’s reactions and what the spacecraft looks like as the main steps are carried out to get into orbit. The astronauts, from left to right, are NASA astronaut Serena Auñón-Chancellor, Roscosmos commander Sergei Prokopyev and ESA astronaut and flight engineer Alexander Gerst launched in the Soyuz MS-09 spacecraft from the Baikonur cosmodrome in Kazakhstan to the International Space Station on 6 June 2018. ESA astronaut Matthias Maurer and ESA television host Richard Hollingham provide commentary taken from the live event. Hunched in their Sokol flight suits that offer protection in case of fire or depressurisation, the trio stay in the crew capsule of the Soyuz – the only module that is also designed to survive a return to Earth. The bags above their heads contain supplies for the International Space Station as every bit of space is used. During a Soyuz launch astronauts typically experience forces of up to 4g – having to work while being pressed into their seats with a force that is four times more than the gravity felt on Earth. The Soyuz commander uses a stick to press buttons as they are too far away from the control panel. The fluffy toys above the astronauts’ heads are mascots and good luck charms but also serve as a simple but effective test to see when the spacecraft is in orbit: when they start to float the spacecraft is weightless and orbiting Earth. Above Sergei is the mascot for the 2018 FIFA soccer World Cup held in Russia. Alexander took German children television icon “Die Maus” with him. The launch went as planned as the 50-m tall Soyuz rocket propelled the astronauts to their cruising speed of around 28 800 km/h. For this launch the astronauts took 34 orbits of Earth over two days to arrive at their destination spending their time in the cramped orbital module of the Soyuz that is no larger than a car. With limited communications and living space the astronauts had time to adapt to weightlessness and reflect on their mission ahead. 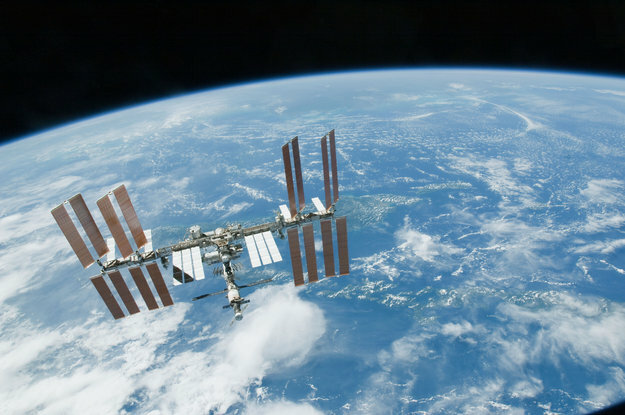 They aligned their spacecraft with the International Space Station and approached the orbital outpost for docking on 8 June 2018. The files for this video were downloaded by the astronauts after arriving at the Space Station. Alexander is a returning visitor to the International Space Station, the first of ESA’s 2009 class of astronauts to be sent into space for a second time. During the second part of his mission Alexander will take over as commander of the International Space Station, only the second time an ESA astronaut will take on this role so far. Ich erinnere mich gut an deine Worte: Unser blauer Planet ist sehr zerbrechlich! Womit du wohl meinst, dass das Leben auf diesem Planeten für Mensch und Flora sowie Fauna, noch lebensfähig ist, aber wie lange noch? Wenn wir so weiter machen, wohl nicht mehr all zulang. Du bist einBeobachter ( alle Cosmonauten/Astronauten) eingeschlossen, die die Kommende Katastropfe von außen schon sehen könnt bzw. erahnen was da auf uns zu kommt. Auf der Erde gibt auch sehr viele Menschen, die das genau so erahnen. Da du so eine Strahlkraft hast, über die Grenzen hinweg, bin ich der Meinung: gemeinsam eine Weltorganisation zu gründen, die allen Neinsagern und Egoisten sagen, dass das Ganze Kapital nicht vor dem Untergang schützt! Fast alle Menschen sagen das sie ihre Kinder lieben, doch die sind die Jenigen, die auf diesem Planeten weiter leben müssen. Meine Ausage lautet: lässt uns jetzt was unternehmen und nicht morgen!